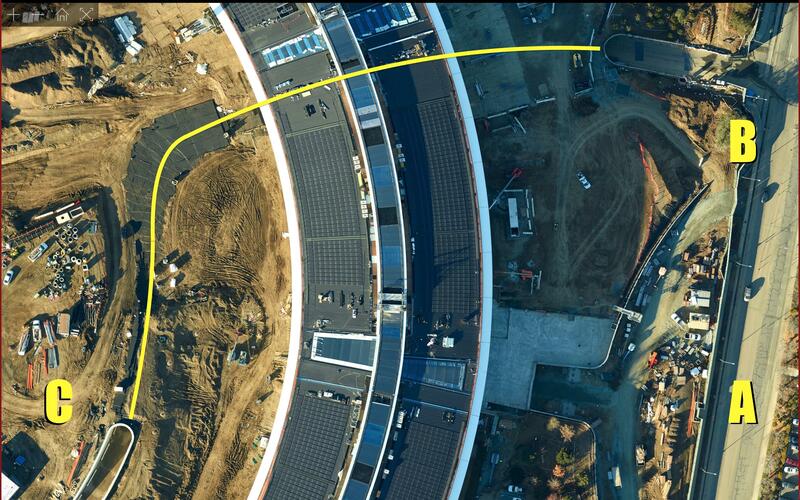 Apple's Campus 2 project in Cupertino, Calif., is one of the most photographed construction sites in the world thanks to a steady stream of looky-loos and drone fly-bys. A newly published 1.7-gigapixel image from aerial camera platform specialists SkyIMD, however, offers a uniquely detailed look at the build progress. Posted to SkyIMD's website, the data-rich bird's-eye view is actually a composite of about 380 photos captured by the 100 megapixel Phase One iXU RS1000, an industrial medium format camera system designed for aerial imagery. According to SkyIMD, the hundreds of shots were snapped aboard a Cessna aircraft flying some 2,000 feet over Campus 2 for 30 minutes on Dec. 22. With a 90mm lens fitted to the Phase One body, the firm was able to achieve an impressive ground sample distance of 3 cm/pixel, good enough to perceive workers and even their tools. The mosaic was stitched together using Photoshop and is largely unedited. A few misalignments and visual artifacts are apparent, especially noticeable near closely aligned geometric shapes like the "spaceship" structure's solar panels, but the overall result is impressive. SkyIMD has the full resolution 34,111-by-49,487 pixel image available in an interactive viewer on its site. Users can zoom in from an area covering approximately one half of a square mile to roughly 10,000 square feet. The image comes just days after the latest Campus 2 drone footage arrived earlier this week, which showed construction of the main building, auditorium and secondary office buildings as nearly complete. Workers are now moving on to landscaping and putting the finishing touches on building exteriors. Very impressive photo/collage. Being able to zoom and pan around the construction really gives a better understanding of how big this project is and how all the different buildings are laid out. Hopefully Apple will update Maps with a Flyover of this building soon after it's completed. Apple should add it as a slo-mo flyover screen saver for the Apple TV. Would go great with their latest additions. Steve Jobs continues to impress. Apples latest wonder is a building. Nice. actually, this makes me think the Spaceship may one day be one of the 7 wonders of the world. Maybe they could make it a little different and fly around it in a circle. That way the slow-mo could just continue to loop a few times rather than the obvious restarting like the current videos do. WHAT. WHY is it not a perfect circle?! It is not a perfect circle due to the distortions made stitching all the photos (~380) together. There are many other anomalies throughout the photo. We chose to share the not-so-perfect result in lieu of spending many hours poking and prodding the image to perfection. So make the video of the Campus 2 "1 Infinite Loop"? Apple Inc. CEO Steve Jobs presents his proposal for a new Apple Campus to the Cupertino City Council. This presentation was recorded Tuesday, June 7, 2011 at the Cupertino Community Hall. What did Steve do? I repeat. He certainly didn't design this building. And there's no indication Apple wouldn't have gotten planning permission without him. What did he do?... had the foresight to keep an eye on that HP property, and when it came up for sale, purchased it... rumour has it that Steve Jobs once worked at HP, and maybe even at that site before Apple existed as a company... in any case Steve Jobs lived in the area and knew about that HP property, so he was instrumental in purchasing the land. What did he do?...he showed up at city hall to show respect for the town leaders in an effort to streamline the approval. The Late Steve Jobs did NOT have to show up at city hall to show his vision of Apple's headquarters. OTOH, worst case, since Tim Cook was "running the company" Steve Jobs feld useful going to that meeting. The building was his idea. He contacted a designer and they worked together. The buildings openness was designed after Steve's philosophy of employees mingling to spark new ideas. Most of the design was demanded by Steve(exposed steel, doors flush with walls). he worked through all the legal processes while DYING. this building wouldn't exist without him and some believe it was his last project. He was at his office a day before he died. I know Steve died years ago but these things take time. Website is back up. Sorry bout that. The amount of traffic we're getting is a bit much even for an AWS server. What did Steve do? I repeat. He certainly didn't design this building. By design you mean act as lead architect? So you're by your definition nothing Steve ever did at Apple was his doing because he didn't design any of the products, only said yes or no to what "real designers" showed him? Is that what you're trying to say? The density of this image makes it much more interesting to zoom in and inspect details. I was looking at the scrap wood in the rolloff trash containers at the main entrance to the site. I wonder how, or if, they recycle that stuff Things like that go through your head when you watch a construction project. Fascinating. Thanks to AI for catching this. Note to SkyIMD: some 3D shots would be very compelling in a VR viewer, if you can do the flights on a Sunday when nothing's moving and then time-shift the shots from a parallel pass for left and right stereo. It's amazing how much more you want to see when it's in 3D. Are you trying to tell us Steve had nothing to do with this building? HAHAHAHAHAHA!!!!! I bet this building was all designed before he passed, if not 90% of it. This building is the last remaining piece he has of Apple, the last piece of the puzzle. Previously I assumed that the main entrance 'A' was how you get to 'the interior C' from the parking garage, but now I wonder if 'B' has its own access to 'C' to avoid visitors and regular employees from ever accidentally getting there from the underground parking structure. Note FROM SkyIMD: We are planning follow up flights. Probably once or twice a month depending on progress. For a good 3D model, we'll need to fly a double grid pattern. We'll probably reach out to a software company to assist with the creation of the next image... any recommendations? Agisoft? Pix4d? Zoom in on the cars on Interstate 280 ... so many identical, white Tesla Model S's.